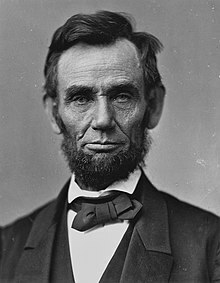 Abraham Lincoln (February 12, 1809 – April 15, 1865) was an American statesman, politician, and lawyer who served as the 16th president of the United States from 1861 until his assassination in April 1865. Lincoln led the nation through the American Civil War, its bloodiest war and its greatest moral, constitutional, and political crisis. He preserved the Union, abolished slavery, strengthened the federal government, and modernized the U.S. economy. Born in Kentucky, Lincoln grew up on the frontier in a poor family. It is with your aid, as the people, that I think we shall be able to preserve - not the country, for the country will preserve itself, but the institutions of the country - those institutions which have made us free, intelligent and happy - the most free, the most intelligent, and the happiest people on the globe. I go to assume a task more difficult than that which devolved upon Washington. Unless the great God, who assisted him, shall be with me and aid me, I must fail; but if the same omniscient mind and almighty arm that directed and protected him shall guide and support me, I shall not fail - I shall succeed. How many legs does a dog have if you call his tail a leg? Four. Saying that a tail is a leg doesn't make it a leg. Biographies, as generally written, are not only misleading but false... In most instances, they commemorate a lie and cheat posterity out of the truth.